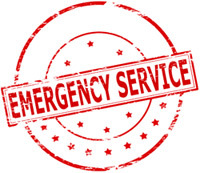 For Emergency service, simply call our main number. We generally work within a 40 mile radius of our main office (Broomall, PA). Please call us with your location to see if we can help you.